Never mind what you eat, how much exercise you do, or how many hours sleep a night you’re getting. There’s a crucial quick health fix that really doesn’t get as much attention as it ought to: and that’s water. A shocking new infographic shows the way your face and body suffer without enough of the clear stuff. As well as making you groggy, hungry and grumpy, not drinking enough water can affect your skin, eyes, weight, hair and nails too. 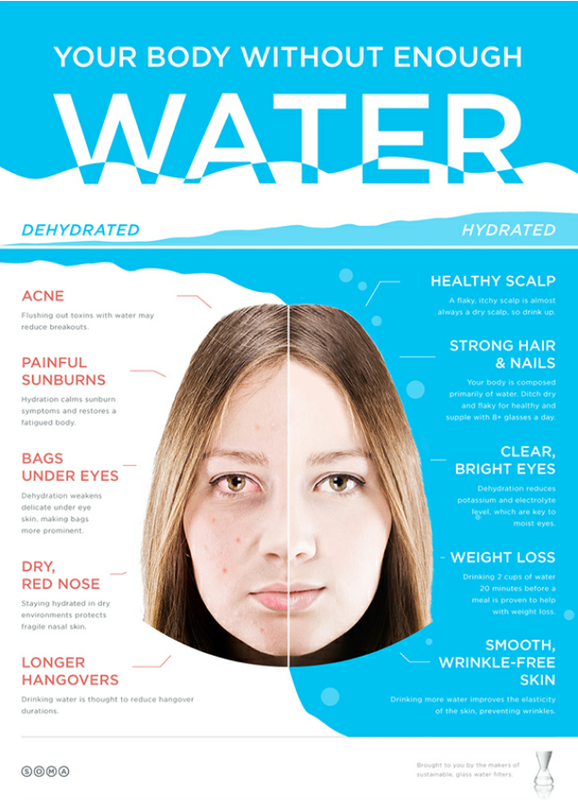 Bags under your eyes, acne, dry skin and longer hangovers are just some of the consequences of not staying hydrated. More water helps you to lose weight – drinking two glasses about 20 minutes before a meal helps shed the pounds. It removes by-products of fat, reduces hunger, raises your metabolism and has zero calories of course. Much thanks to stylist.co.uk for content and images.